Mayor must reverse ‘separate and unequal’ school policies, end chronic neglect of South, West side public schools, and adequately staff school nurses, clinicians, ESL services, other vital education resources. Watch video of the livestreamed press conference. CHICAGO, January 15, 2019—Chicago mayor Rahm Emanuel offered more than $2 billion to Amazon, and has proposed funneling $1 billion into the private Lincoln Yards development – while neighborhood public schools on the South and West Sides struggle with the consequences of years of disinvestment and deep budget cuts. The Chicago Teachers Union threw down the gauntlet today on those distorted funding priorities, calling for Emanuel and CPS to invest those dollars instead in educational equity for the school district’s overwhelmingly low-income Black and Latinx students. The CTU has encapsulated those demands for educational equity in a 75 point contract proposal that they delivered today to CPS – and directly to the office of the mayor, who appoints the school board and determines who occupies top CPS positions. 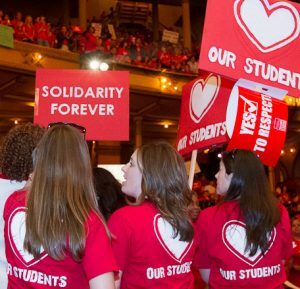 Because teachers’ working conditions are students’ learning conditions, the CTU has delivered a set of demands designed to address critical issues in staffing, class size and school conditions. While Emanuel has called contracts sacrosanct when arguing against re-examining either the despised parking meter deal or toxic swap deals with big banks that have fomented fiscal crisis in CPS, that concern ends when it comes to contracts with public workers like CTU members. Emanuel unilaterally cancelled contractually agreed-upon raises for teachers and paraprofessionals when he took office, and on January 1 his hand-picked CPS officials unilaterally raised health costs for educators – a move that will cost teachers hundreds of dollars at a minimum. Classroom overcrowding is a critical issue for parents and educators. In 1995, Chicago’s mayor lobbied for and won total control over CPS, making Chicago the only school district in the state that does not elect its school board. That state law also gave the district the upper hand in class size negotiations. That law does not extend to charter operators in the city, though, and with solid, enforceable class size language emerging in the CTU’s charter school contracts – along with contractual language on issues like sanctuary schools – the union is stepping up its fight for this key demand in district-run schools, as well. Overcrowding is a serious issue in many schools. The advocacy group Parents 4 Teachers recently analyzed CPS data they’d obtained through the Freedom of Information Act. They found that more than 1,000 elementary grade classes are over CPS’ current class size guidelines with one kindergarten class at Westcott Elementary on the South Side crowding in 48 children. According to research, dropout rates for low-income black boys fall by 39 percent when a Black teacher leads the class. Yet Emanuel and his predecessor have orchestrated a full-bore push-out of Black educators, whose numbers are down to barely 20% from roughly 40% in 2001. And because of Emanuel’s ‘student-based budgeting’ scheme, which funds schools based not on student needs but on raw enrollment counts, many South and West Side schools cannot afford to hire veteran teachers – including Black teachers. The CTU’s contract demands are structured to address the attack on veteran Black teachers, who are overwhelmingly female, within a larger package of demands that seek to undo school policy that has created enormous inequity for low-income students of color, whose families are also under intense pressure from gentrification, racist policing policies and multi-generational disinvestment in Black and Latinx neighborhoods. The disinvestment crisis that many South and West Side neighborhoods confront has been intensified by the loss of living wage work to thousands of Black teachers and paraprofessionals who Emanuel and his predecessor have purged from the school district. The CTU is also demanding an expansion of its contractually won ‘sustainable community schools program’ which Emanuel agreed to in the 2015 contract but only began implementing for this school year. Educators want the program, which pairs schools with community partners to provide the kind of wrap-around supports that students in high-risk communities need to succeed, to 100 South and West Side schools. The CTU is also calling on CPS and the City to address deficient sanctuary policies and instead create real sanctuary schools for immigrant and other students – a commitment just won in the CTU’s bargaining with charter operator Acero. The former UNO operator had balked at that demand, a key issue in the CTU’s groundbreaking strike against the operator in December 2018 – the first strike of a charter operator in the nation’s history. The need is real for students, who confront fear of ICE raids on students and families, disparate call rates to police for Black students, and a racist gang database that unfairly labels students without due process or recourse. The CTU is demanding schools that protect communities and serve as save spaces where kids can learn safely without bias or stigmatization. Educators are also demanding sweeping implementation of system-wide restorative justice policies, a strategy that CPS says it embraces but has failed to widely implement or fund. And teachers are taking aim at the wider issue of a critical lack of access to affordable housing for families, a linchpin in the conditions that are driving families out of the city and leading to falling student enrollment – especially among Black students. The CTU will move to begin bargaining immediately. Under the timeline agreed to by CPS, the union and management could be in a fact-finding phase by this spring. 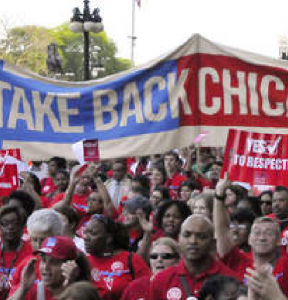 That puts the union squarely on schedule to take a strike vote around the beginning of the 2019-20 school year – a vote the CTU expects to be overwhelmingly positive.